Fellow twin cities naturalist Timothy Boyle had an eye out for wildlife even while sipping on a coffee at a coffeehouse last week. 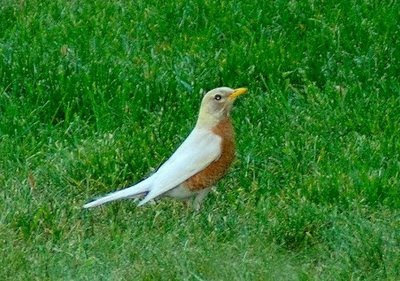 While walking down the street with his camera he spotted this odd looking American Robin in a yard. The bird he photographed is a great example of partial leucism. I've blogged about this condition before. It can give us American Goldfinches with white patches or even make a female purple finch look like a newly discovered species. Collard finch anyone? As always happens with a photo like this, when he posted it online there was some of the discussion about the terms partial albino versus partially leucistic. While the term partial albino is bandied about a lot, it isn't really correct. Albinism is a genetic condition that wipes out the body's ability to create the pigment melanin. Using the above robin as an example, if it was truly an alboino, it would also have white legs, white beak, white head, white breast, etc. It would also have those famous pink albino eyes. The reason they look pink is that you can see the red from the blood in the retina. The reason you cannot have a partial albino is that since albinism is genetic it is always systemic, i.e. affecting all of the animal. How do we get a partially white animal then? Enter Leucism. Leucism results from defects in pigment cells. It can affect just one cell or all of the cells. This means we can get a bird with just one odd white feather or lots of white feathers. We can even get a bird with all white feathers but normal colored eyes, beak and legs. This is still not an albino. For more reading on color aberrations in birds you can download the excellent journal article, Not Every White Bird is an Albino: Sense and Nonsense About Color Aberrations in Birds by Hein van Grouw .